The HevAir 6k is a domestic scale wind turbine suitable for use in homes, farms and light manufacturing applications. It was designed and is manufactured in our manufacturing facility in Crossmolina, Co. Mayo and is rugged enough to handle and survive in the Class 1 wind region that is the West of Ireland. The HevAir 6k balances a reasonably priced wind turbine with superb build quality and excellent reliability. 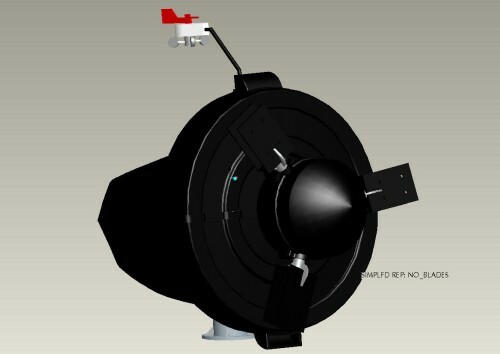 It is designed to have a maximum efficiency in the lower wind speed regions as these are generally the most commonly occuring and frequent wind conditions. This means that whenever the wind is blowing, you can be safe in the knowledge that the wind turbine is converting that wind energy into useful power that can be used in your home, farm or industrial application. 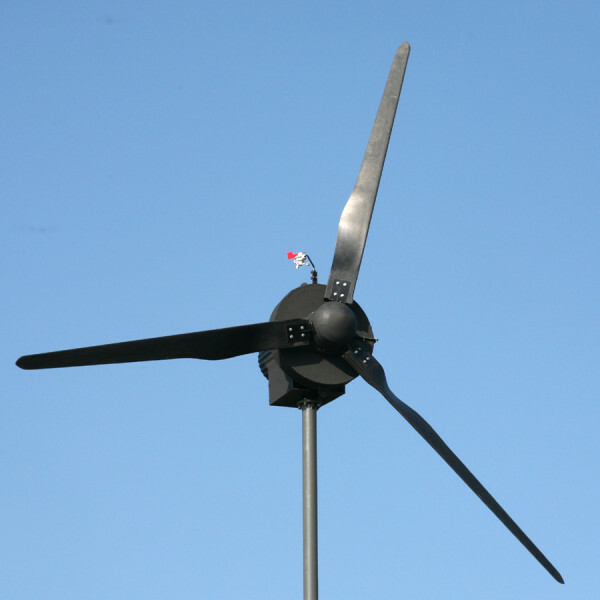 The wind turbine employs an active blade pitch mechanism which allows each blade to be rotated around its own axis. By rotating the blade around its own axis the angle between the blade and the wind can be changed. Changing this angle has the effect of either increasing or decreasing the efficiency of the blade. If the wind turbine blades are rotating faster than the maximum allowable RPM then the efficiency of the blades is decreased by increasing the blade angle so that the RPM will reduce. If the wind turbine blades are rotating slower than the maximum allowable RPM then the efficiency of the blades is increased by decreasing the blade angle so that the RPM will once again increase. These movements are decided by the onboard microprocessor and carried out automatically. The aim is to keep the blades rotating at a constant RPM so this movement may occur many times every few seconds. 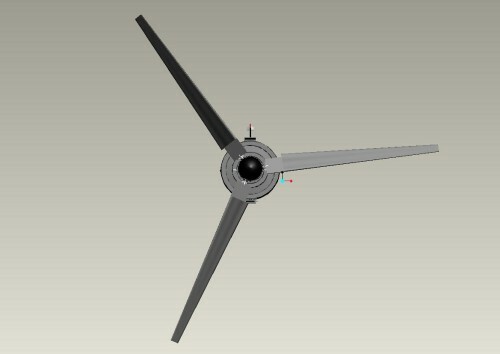 The active blade pitch mechanism can also be used to shut the wind turbine down in the event of storm force winds, in this situation the blades can be rotated by 90° which has the effect of decreasing the blade efficiency to zero. There is also a fail safe mechanical disk brake which can bring the wind turbine to a stop if needs be. These devices are installed for extra safety encase the unexpected ever happens. 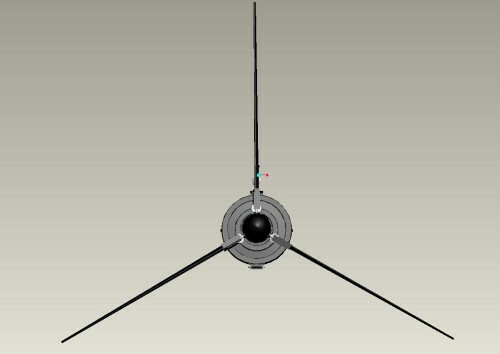 The turbine faces into the oncoming wind by measuring the wind direction and making the necessary adjustments so that as much of the oncoming wind can be captured by the blades. This is achieved by the microprocessor reading information sent to it by the windvane and calculating the average wind direction. The microprocessor then sends a signal to the active yaw motor which rotates the turbine into the optimum direction for energy capture. The HevAir 6k controller is a microprocessor unit designed by Heverin Renewable Energies specifically to control the HevAir 6k wind turbine. As well as controlling the wind turbine it can also send data to the HevCom Datalogger or to a computer so that the performance of the wind turbine can be monitored. The controller also allows for remote monitoring of the wind turbine from our facility using GPRS technology so that we can control the turbine and update the software by the click of a button. The Mean Wind Speed is the average yearly wind speed that occurs at the site location. The Annual Kwh is the Annual Kilowatt Hours that the wind turbine is expected to produce based on the Mean Wind Speed. The Mean Power is the average instantaneous power that the turbine produces based on the Mean Wind Speed. 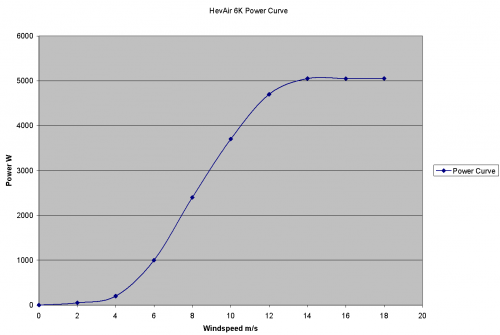 This power is different to the power suggested by the power curve as it takes into account the variable nature of the wind (i.e. the wind never blows at a constant speed, it is continuously changing). The power curve shows the power output of the wind turbine under steady wind conditions. The above calculations are also based on the assumption that the Wind Speed Standard Deviation / Mean Wind Speed = 0.52. This quantity is essentially a way of describing the occurrence frequency of the Mean Wind Speed. (i.e. how often is the Mean Wind Speed expected to occur throughout the year).